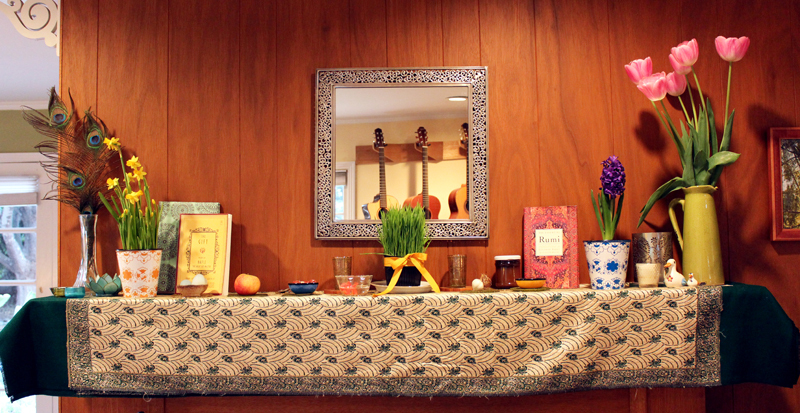 This past Friday was one of my favorite days of the whole year : NoRooz! I'm sure all you loyal readers remember some of my previous Persian New Year posts from years past. Although I am not in any way Persian, I first learned about this holiday years ago while I was dating an Iranian man for a few years. He and I eventually split up and we have long since lost touch, but my love for NoRooz has lived on with unwavering affection. I often think of that former boyfriend at this time of year and send him a NoRooz blessing through the ether. This year's feast was the result of pretty much two days straight of cooking and prepping and fussing in the kitchen. In other words, a totally awesome time! Usually when I host parties, my excellent friends offer to bring something or make something, but I really love to do all the cooking for NoRooz. I think of it as a New Year's gift for my loved ones! I thought of making my own aged cashew cheeses - but these days the store-bought selections are so good that I took the opportunity to save myself some time and to try two new vegan cheeses that I hadn't tried yet. I bought the Heidi Ho Pure Chevre and Treeline Cheese Herb & Garlic flavor. Both of these were great and were a total and complete hit with everyone at the party! Woo hoo! Finally there are vegan cheeses that I can proudly serve to a room full of non-vegans and hold my head up high. What a great thing. 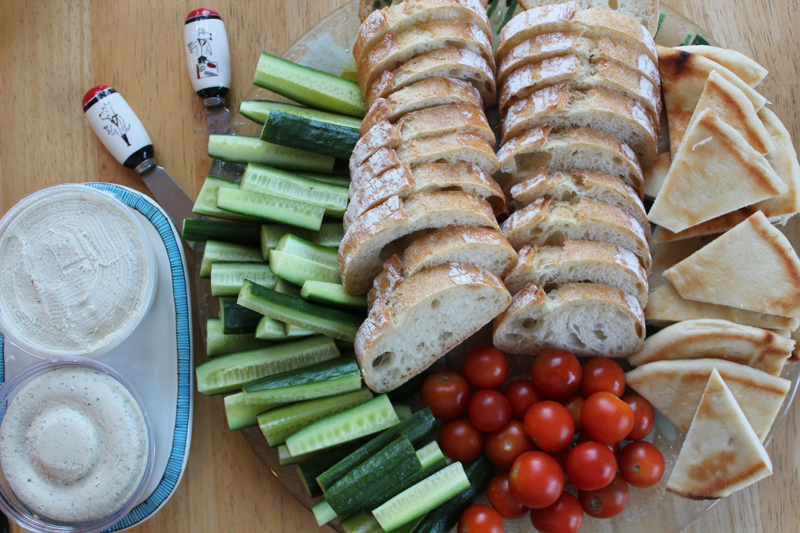 Along with the cheeses were some fresh baguette slices, flat bread wedges, cherry tomatoes and those excellent little organic Persian cucumbers from Trader Joes. 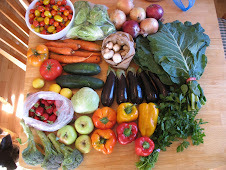 I almost never buy my produce at TJ's (all that packaging!! ), but these Persian cukes are so special and so tasty, so it was a fun splurge. 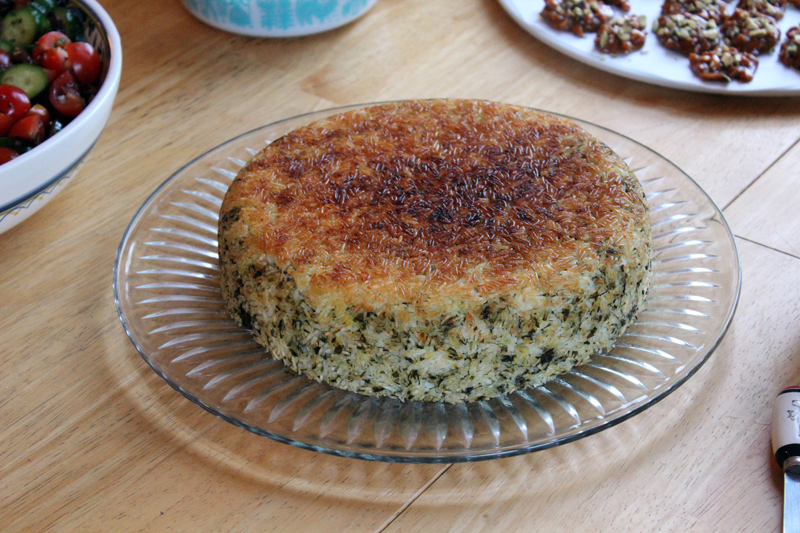 There are a few dishes that one simply must make for NoRooz, but every year I also like to try at least one or two recipes that I've never tried before. This year, I was snooping around the web looking for some NoRooz inspiration when I came across this recipe. Using my own homemade soy yogurt, this was a total cinch to veganize, and the result was fantastic. I put this out alongside the cheese platter so that it could also go with the bread slices. I loved the flavor of this spread so much -- and actually, even the spinach-onion-walnut combo on its own was totally delicious. I think I might experiment with using that combo as a dumpling filling (without the yogurt), because it was so tasty. Ajil is sorta like Persian Trail Mix... and actually it's usually eaten on the Tuesday night/Wednesday eve before NoRooz... but it's also very tasty and delicious, so I broke the rules and served it. 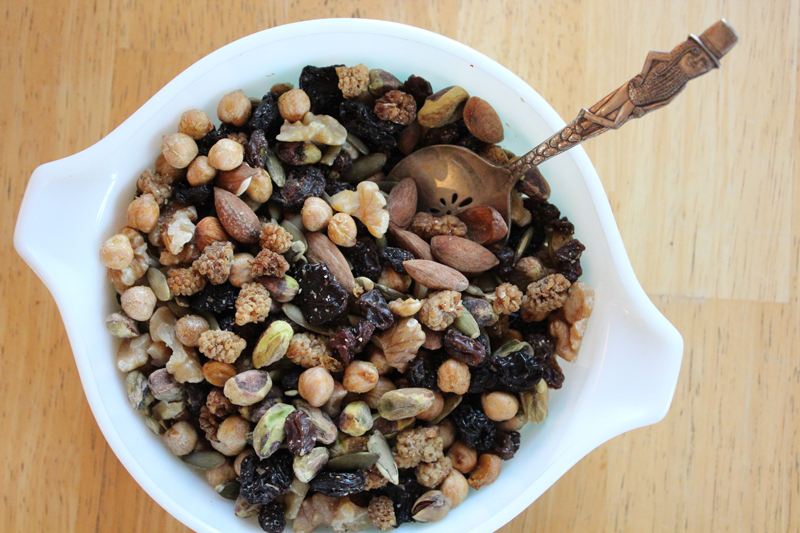 Plus, I had a few kids at the party and wasn't sure how adventurous their palates would be -- but I figured that everyone can get into a good bowl of nuts and dried fruits. There are already a million good Ajil recipes online, but my mixture involved raisins, almonds, pumpkin seeds, dried chickpeas, pistachios, raisins, dried cherries, and dried mulberries. So, you see, it's pretty good! 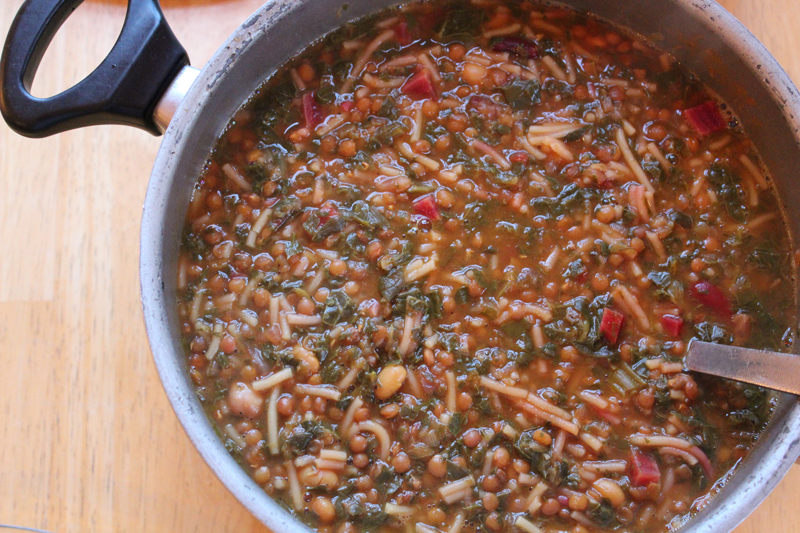 This soup is pretty much the main Must Have at any NoRooz celebration. It is so good!!! It's got 3 kinds of beans, lentils, beets, boat loads of fresh herbs, beets, spinach, and noodles. It takes about 2 1/2 hours to make... but mostly that's inactive... You can find my recipe here. This year we had a bigger group than usual, so I made a full batch and there was just the tiniest little bit left over. Maybe I should have made more! Everyone agreed that this was one of my best batches of this soup that I've ever made. Isn't it funny how you can make the same recipe from year to year, but sometimes one batch just doesn't "have it" and another time it can taste like the most amazing thing ever? Well, this year I got lucky! 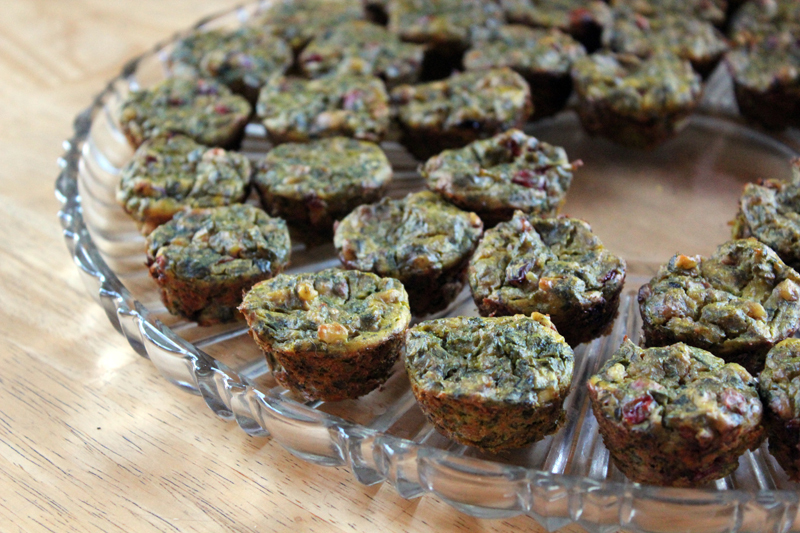 Kuku Sabzi is usually an omlette with loads and loads of minced herbs, walnuts, and barberries. Over the years I have tried so many different methods of veganizing this recipe... but last year I really hit the nail on the head. To tell you the truth, I had forgotten about this adaption that I tried for the first time last year... but then when I was writing up my menu and shopping list, I decided to look over some of my previous NoRooz posts for recipes and such. I learned so much from myself! Ha ha. These are based on the recipe for Mini Muffin Omlettes from Isa Does It, and then just shifted the seasoning to be more like Kuku Sabzi. You can read more about my recipe and method on last year's post ... which is very helpful indeed, if I do say so myself. My own post also reminded me to use my food processor to chop the herbs -- which was a huge time and space saver. Thanks, self! I love love love this rice. You may have noticed at this point that many of these NoRooz Dishes feature loads of fresh herbs ~ it's one of my favorite things about this holiday. Celebrating the arrival of a new year at the Spring Equinox makes so much sense... it's just so in harmony with the cycle of nature, when every plant is busting forth with blossoms and new, tender growth. So, all the fresh herbs are also a symbol of spring greens, and are included in so many dishes. In preparation for this party, I purchased 3 bunches of parsley, 3 bunches of cilantro, two bunches of dill, two bunches of mint, 2 bunches of scallions, and 2 pounds of fresh spinach. Booya! The Persian rice is legendary for this crispy golden crust called "tahdig," and also for the tender non-clumpy rice inside. It's basically a giant cake of rice. I used the recipe and techniques for Persian Rice from Vegan Eats World, but I subbed out her seasoning suggestions and added in fresh herbs. This year, I doubled the recipe and added in 1 cup each of minced parsley, cilantro, dill, and chives. I love that Terry's recipe includes yogurt ~ I think it adds a nice creaminess to the final result. This year I used plain coconut yogurt, because one of my guests is allergic to soy and I already had a couple other dishes featuring soy (the yogurt dip and the mini omlettes). I wasn't sure if the sweetness in the coconut yogurt would be a factor, but it totally wasn't. As you can see, year by year I am slowing getting the hang of this thing. Can you even believe how beautiful and golden and lovely that crusty rice is? And the inside was just as light and fluffy as you could ever want it to be. Contented sigh. There was none left over, so I took that to be a very good sign. Just look at those colors! 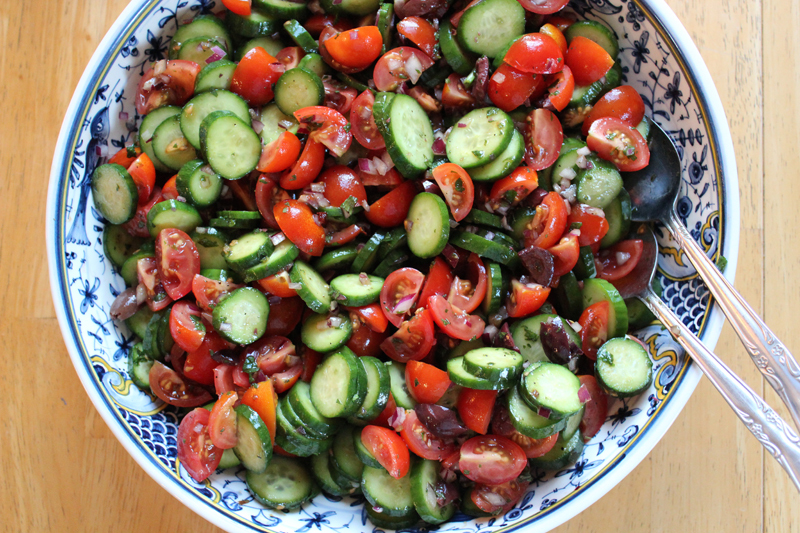 This lovely salad featured those same darling little Persian cucumbers, cherry tomatoes, olives, red onion, and mint. For something different, I used a nice salad dressing recipe from Silk Road: A Vegetarian Journey - I just tweaked it a little by adding extra lime juice and extra pomegranate paste. So good! Flipping through Silk Road reminded me of what an AMAZING cookbook that is and got me all fired up to make more recipes from it. 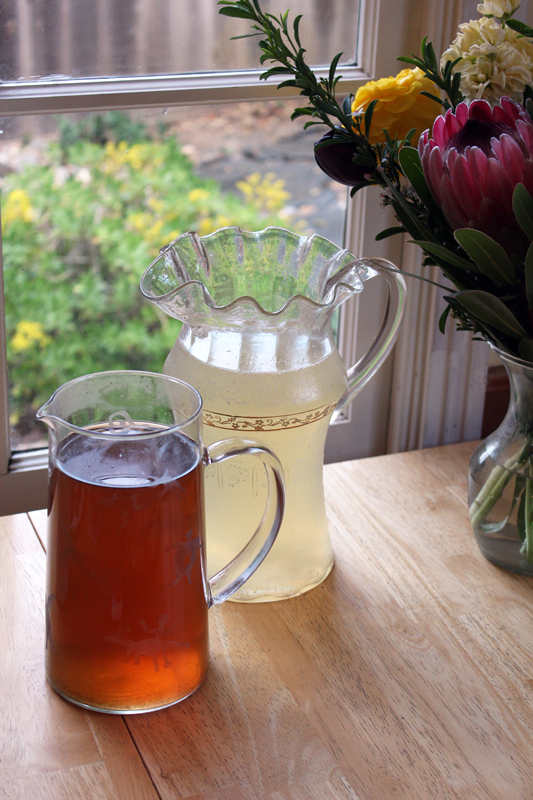 I've made both of these special drink recipes for previous NoRooz fetes, and they were both as great as ever. The Mint Lemonade recipe is from Madhur Jaffrey's World Vegetarian and involves making a hot simple syrup and then pouring it over a load of minced, fresh mint and allowing it to steep. Then, combining that with fresh lemon juice and water. I used sparkly water for extra panache. The Omani Lime Tea is totally particular, and not like anything else you've ever tasted... but it's also very good! Dried limes are funky little things -- they're salted and dried and you have to bust them open with a hammer! A "culinary hammer," as I like to call it. You can find the recipe we used here. I say "we" because up until now, I've neglected to mention that my excellent friend came over and spent the whole afternoon in the kitchen helping me cook and prepare. Her help was so invaluable! With a pal in the kitchen, every thing is more fun and goes more smoothly, there's less stress, and I can have a more ambitious menu since I know I'll have help. Plus, what a fun way to spend time together! In addition to these drinks, I also had some Trader Joe's Pomegranate Sparkly juice and some plain sparkly water... just in case anyone was feeling less adventurous. I have to say, both Silk Road and World Vegetarian have some very intriguing Persian drink ideas that I haven't yet tackled, but one year I'll really go all out and make a selection of unexpected drinks. Won't that be fun!? One of the things that really made me fall in love with this holiday is the Haft Seen display. You can read all about it on Wikipedia here. The table features at least seven (haft) items that begin with the letter "s" (sin) in Farsi. Each item has a special symbolism for the new year ~ an apple for health, garlic for medicine, dried sumac for the color of the sunrise, vinegar for old age... and so on. I always set the display up on my mantle. Every year I enjoy the ritual of assembling all the special items and arranging them with care and thought. from left to right: candles, daffodils, Hafiz and Rumi, glass eggs, an apple, dried oleander fruit, a (plastic) goldfish in water, sprouted wheat, (vinegar hiding behind the sprouts), rosewater, garlic, samanu (pudding made from sprouted wheat berries), dried sumac, more Rumi (never enough Rumi! ), and then off-screen: a hyacinth, more candles, and some tulips. Every year, as a part of the party, I stand by the mantle and we go over each of the items and what they symbolize and we try to remember their names in Farsi. One of my sweet friends who comes every year is indeed Persian, and - poor thing - we always look to her as our expert on all things authenticly Persian. However, fortunately for her, these days the internet is always available to help us out! There are many tempting goodies to choose from when planning your NoRooz dessert options, but in my opinion, you should never skip over Sohan As-Ali. 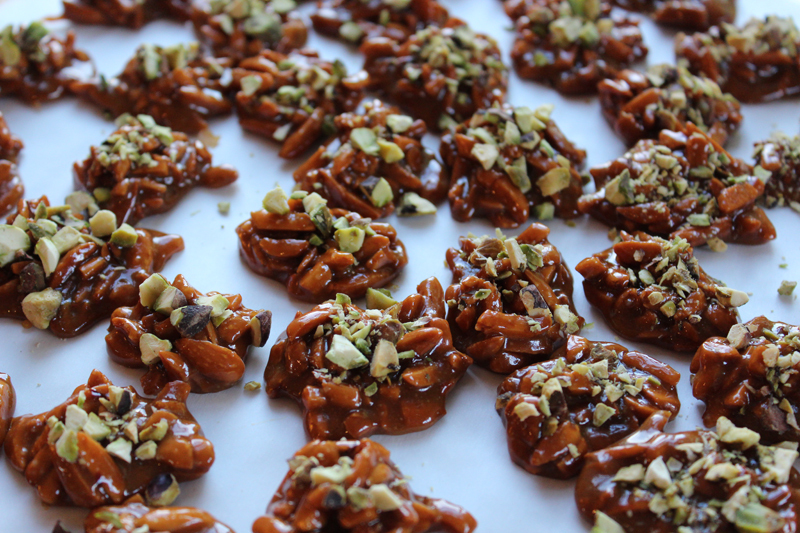 These were the first Persian treat that I ever learned to make and they are just amazing -- almond brittle flavored with saffron and rosewater and then topped with finely chopped pistachios. Ahhh. So many subtle and evocative flavors in one perfect little morsel. This year's batch was a bit stubborn and took for-ever to reach the right temperature... but thanks to my candy thermometer, plenty of patience, and with some familiarity with how the goop should look -- they ended up coming out just perfect. Huzzah! Here's my recipe. 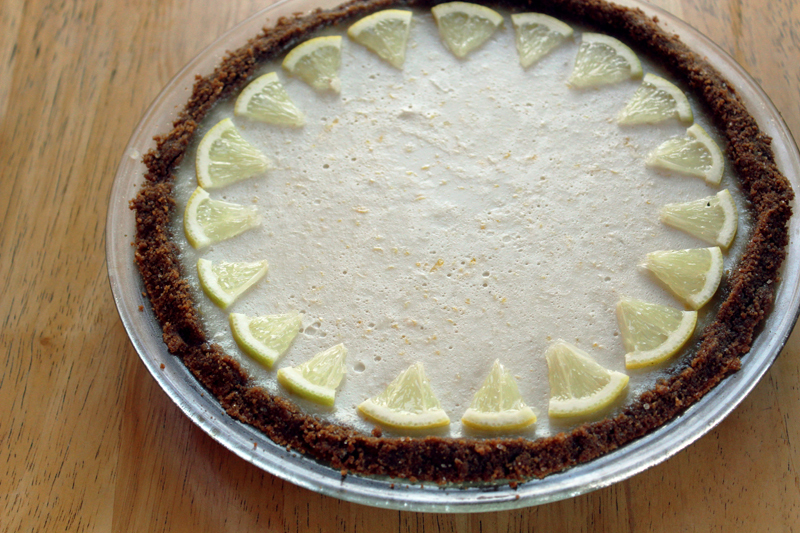 Every year I also make a Key Lime Pie, because the day after NoRooz is my Dad's birthday, and Key Lime Pie is my dad's #1 favorite treat. I used the wonderful and flawless recipe from the PPK (also found in Vegan Pie In The Sky). This year I used the Specculos cookies from Trader Joes (instead of graham crackers) to make the crust and the crust was faboo!! Definitely a good pairing. This whole pie was completely polished off... which is always a good sign. This year's birthday celebration for my dad was especially sweet because he was just in the hospital last week and we weren't sure if he would be well enough in time to celebrate NoRooz with us. Well, quite happily, he healed so quickly that he was even released from the hospital sooner than anticipated and has been resting and recovering quite well. I sure do love my dad and every key lime pie I get to make for him gets sweeter and sweeter every year. 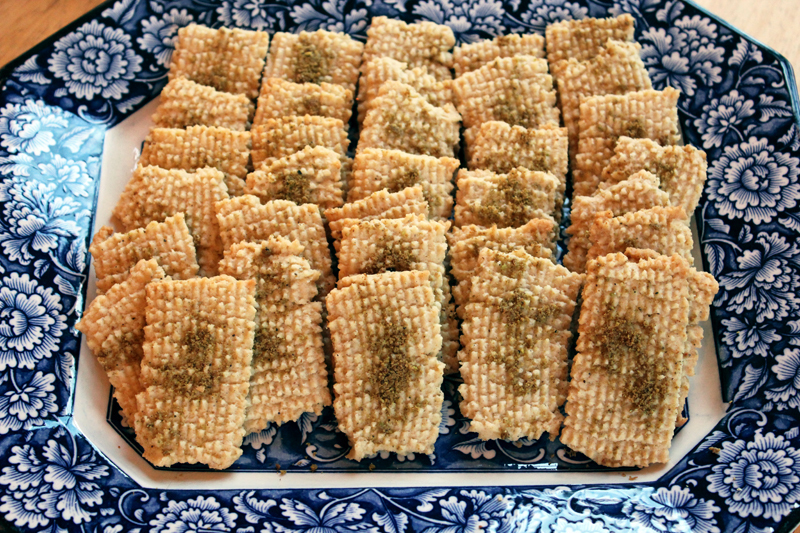 I took note of this recipe quite a while back and stashed it away in my brain for NoRooz. What a hit! 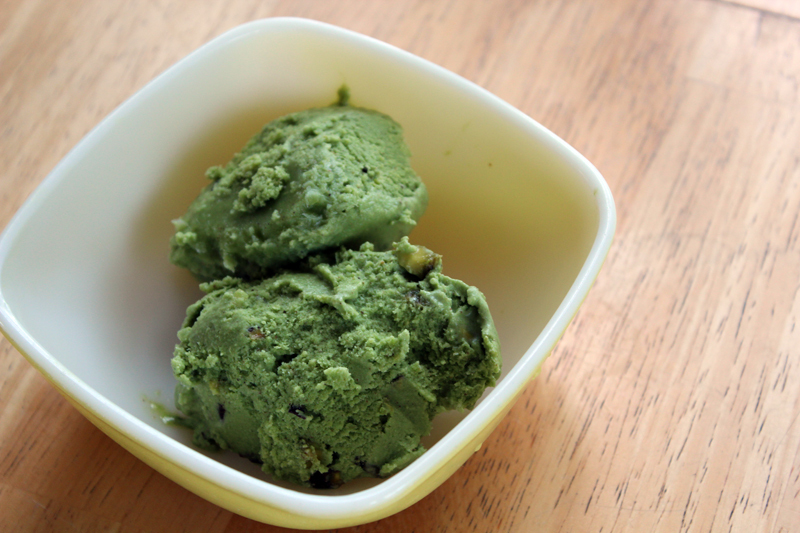 Believe it or not, this ice cream gets its glorious green color from fresh spinach!! 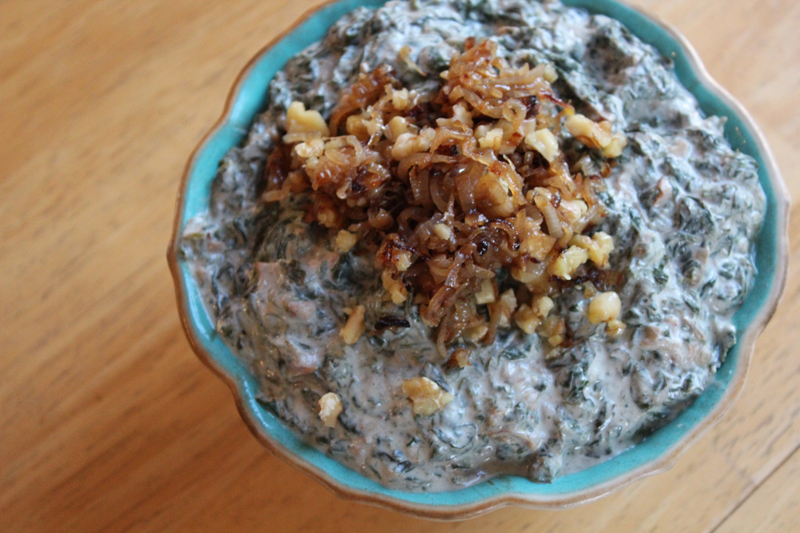 Flavorwise, the spinach completely disappears, but the color is fantastic. Somer's recipe called for almond butter, but for extra pistachio oomph, I made some pistachio butter in my Vitamix first and used that instead. (I also used almond milk in place of soymilk). I think this was my favorite homemade ice cream ever! Next time I make it, I'll cut back the agave nectar just a bit, and also add some rosewater and saffron to truly Persian-ify the recipe. I also doubled the amount of pistachios called for, because more nuts is always better. More nuts = better life. There's still a little bit of this left in the freezer, but I don't think it will be there for much longer! Every year, right before NoRooz, a number of Persian bloggers team up and they each post a recipe for NoRooz. That's where I found this lovely recipe for NoRooz Cookies on ZoZoBaking. The recipe was easy enough to veganize: I used 2 tsp EnerG Egg Replacer + 1 Tbsp water for the egg yolk, soy-free Earth Balance for the vegetable fat, and almond milk for the milk. I loved that the recipe was so specific with grams for each ingredient. My dough came out perfectly soft and delicious (of course I quality-tested the dough, just in case!). The author of the recipe mentioned that she used a meat grinder to press out her cookies. But since that is most definitely not a kitchen tool I keep around, I used my cookie press instead and my cookies came out looking just like hers! I was delighted. These are essentially a very light and delicately sweetened sugar cookie with a perfect hit of cardamom and topped with pistachio dust. So elegant and so delicious. There were two left but Mr. VE&T ate them today. Alas. The cookies are gone, but my memories will grow on. I've got my sprouts still growing on the mantle, and 13 days after the equinox, I'll take them down to the ocean to toss them into the sea and make room for a new year. I know that many of you are suffering through so much snowy weather that spring feels like an impossible reality... but hopefully it will be on its way to your part of the world soon. 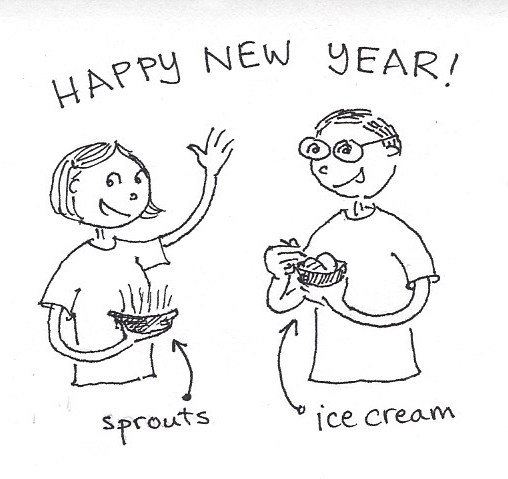 Here's to a new year of growth and discovery and compassion and laughter! 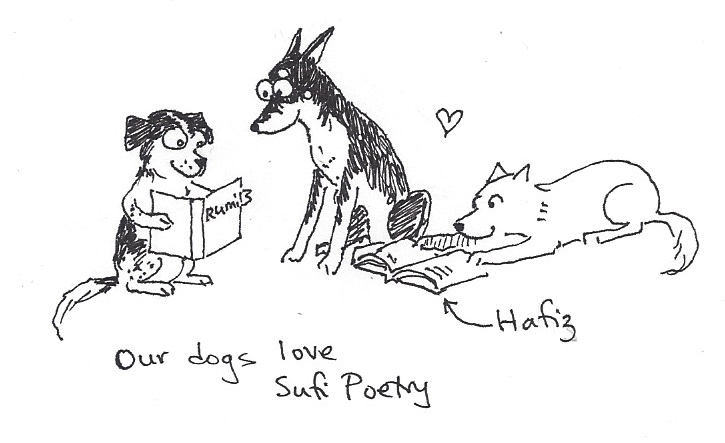 Dear Amey....What a lovely post :) I love your version of Nane-Charkhi and I LOVE your site and your team, especially dogs reading Hafez ...LOL adorable!! Ahh - as always, you do not disappoint! What a beautiful feast, and what a beautiful way to welcome spring and the new year. Congratulations on your gorgeous tahdig - best yet! Every year you amaze me with your NoRooz feast, and I gaze at each item and vow to make it! The soup, the salad, the rice and the muffins are calling my name. Happy Persian New Year! Thanks Andrea! I was happy how many recipes I could find to link to online. Also, lots of the food is gluten free -- I even used brown rice noodles in the soup and I think they were better than regular noodles. They didn't get gummy or icky or anything. Let me know if you try any of the recipes -- they really aren't that hard to make, and they're all really delicious. Yes, it was SO great that my dad was well enough to come. I was feeling so sad when I realized that he might not be able to come. <3 My husband plays guitar and piano. He used to build really beautiful guitars, but recently he stopped. We'll see what comes next! 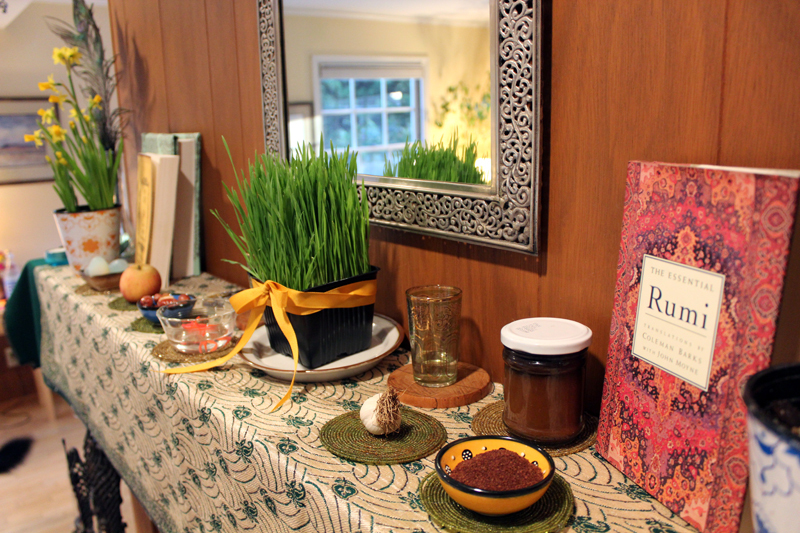 This is always one of my favourite times of year because I love your NoRooz posts! I was SO glad that you mentioned that you had a friend helping you in the kitchen because by that point I was thinking wowza, Amey must have been SO TIRED after all of that cooking! I also laughed out loud when you mentioned your blog helping you to remember to chop herbs in your food processor - I always use my blog to remind me about things I've cooked or places I've been! Our past selves are so helpful! I'm also so glad that your dad was able to make it to the celebration, your key lime pie looks like just the right motivation to heal fast. I always love seeing your NoRooz posts. Even with a friend helping, that is an impressive spread! I am in awe of that perfect golden crust on that rice! What a beautiful spread! That soup looks so fantastic, and I want to make some ajil for my kiddos to snack on! I'd never heard of this celebration before, but this amazing food makes me want to celebrate it too! The golden crust on that rice looks sensational! Amey, how lovely that you celebrate Nowruz as well. It really is a celebration for Persians and non-Persians alike. I found your site through Zozobaking and look forward to delving deeper. Happy Nowruz!